It's always heart-melting when huge artists make some charity activity releasing new music to help those who really need it. This Autumn Idol-show has made successful shot when show participants released song "All I Need Is You" that reached #2 of Swedish chart and a bit later we've got another release from whole bunch of the loudest names of Swedish pop - Ola, Darin, Alcazar, Jessica Folcker, Sarah Dawn Finer, Plura, Velvet, Hanna Hedlund, Martin Stenmarck, Lasse Berghagen, Anna Maria Espinosa, Claes Janson, Dolly Dolores, Jasmine Kara, Anna Sahlin, Kim Fransson, Promoe and Jakob Hellman. Something incredible? Whole project was initiated by Tess Merkel from Alcazar in collaboration with SOS Barnbyar organization to help kids who lost parents or who live in financialy especially problematic terms. 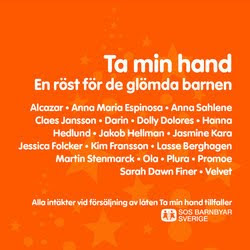 The song "Ta Min Hand", very kind hopeful a bit funky and a bit gospel-breathing track, was written by Christopher Dominique and Mårten Edh and released physically and digitally. Company around "Ta Min Hand" was also supported by big concert in Kungsträdgården and performances on TV and radio, so below you can watch official video for this song and performance in Efter Tio.